Well … this recipe doesn’t really qualify as “healthy, brown” food, but Nathan has been working so hard. He deserved a treat and chocolate chip cookies seemed like the perfect indulgence. In my defense, I researched online to try to find the healthiest ingredients for the cookies. I decided to use dark chocolate instead of semi-sweet chocolate, I used 50/50 whole-wheat flour instead of white and this recipe had less sugar and eggs than several others I have used. It also added oats, which gave them a great texture. You could add in lots of things to this recipe … raisins or dates … whatever you like. I found a few recipes with nutmeg and cinnamon and we really liked the flavor, but you can leave it out if you like. – Combine the sugars with an electric mixer. – Cream the sugars with the softened butter. – Add in the egg, vanilla, and milk. – In a separate bowl, sift together the flour, soda, baking powder, salt, cinnamon, and nutmeg. Add slowly to the wet mixture until incorporated. 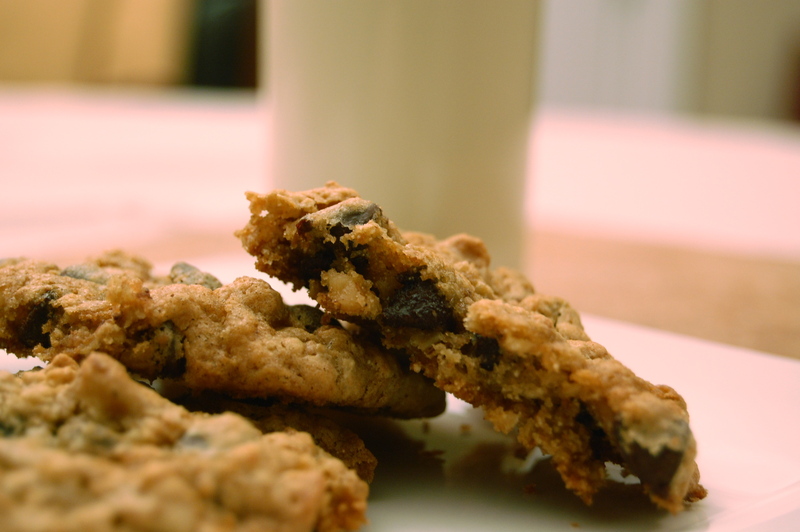 – Once smooth, stir in the oats, chocolate chips, and walnuts. – Using a teaspoon or a small ice cream scoop, drop rounded teaspoons about two inches apart on a cookie sheet. – Bake for 12-15 minutes or until lightly golden around the edges. Makes around two dozen. – Serve with a cold glass of milk! ← I’m in LOVE with a TUB!